In June 2001 Rahna Reiko Rizzuto went to Hiroshima in search of a deeper understanding of her war-torn heritage. She planned to spend six months there, interviewing the few remaining survivors of the atomic bomb. A mother of two young boys, she was encouraged to go by her husband, who quickly became disenchanted by her absence.It is her first solo life adventure, immediately exhilarating for her, but her research starts off badly. Interviews with the hibakusha feel rehearsed, and the survivors reveal little beyond published accounts. Then the attacks on September 11 change everything. The survivors' carefully constructed memories are shattered, causing them to relive their agonizing experiences and to open up to Rizzuto in astonishing ways.Separated from family and country while the world seems to fall apart, Rizzuto's marriage begins to crumble as she wrestles with her ambivalence about being a wife and mother. 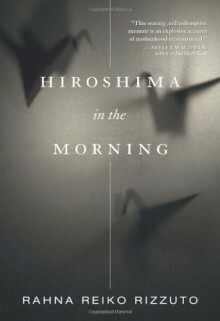 Woven into the story of her own awakening are the stories of Hiroshima in the survivors' own words. The parallel narratives explore the role of memory in our lives and show how memory is not history but a story we tell ourselves to explain who we are.Rahna Reiko Rizzuto's highly acclaimed first novel, Why She Left Us, won an American Book Award in 2000. She is a faculty member in the MFA in creative writing program at Goddard College, and lives in Brooklyn, New York. I will finish this one day. But not right now.